How to Remove the Need for Saviour Schnapps. After completing the first quest (after your town Skalitz gets raided), you must run down a hill to get away from the invaders. You are supposed to find a horse to ride to the neighboring town. On your way to the horse, you can hear a woman "Theresa" screaming for help. Kill the soldiers surrounding her to earn this trophy. If you go straight for the horse you will miss this. During the Ginger in a Pickle main quest you must find 3 coal-burner camps. At the third camp, when talking to the twins there, agree to kill the bandits for them (do not lie to them about having killed the bandits already). Now go kill the bandits in the woods (step 2 in video). Return to the charcoal-burners. They now tell you where Ginger is. Talk to him, pick dialogue "Just go there and see what happens”. Travel back to Neuhof and talk to Sir Radzig to finish the quest. Now advance time by 24 hours to make Ginger spawn in Neuhof and talk to him to make the trophy pop. You must do this at the very start of the game. 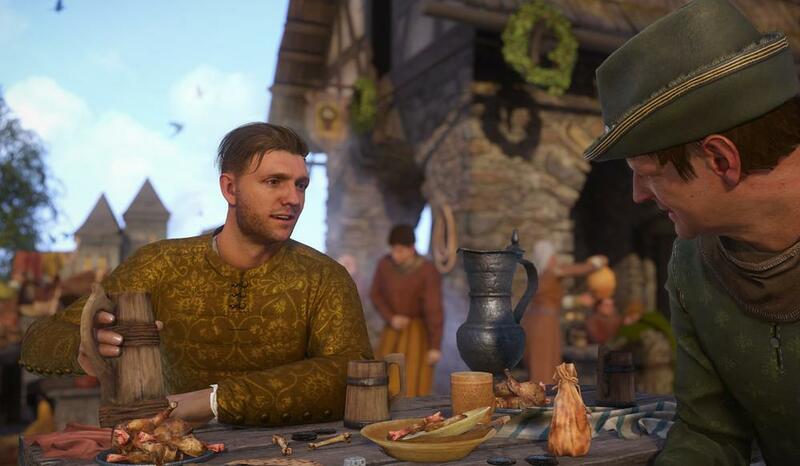 Skalitz is the village where the game starts. Steal something from a food stand while others see you. Then a guard will come to arrrest you. Press L1 + X to surrender. Tell the guard you have no money and agree to imprisonment for your crime. Then you get a special cutscene and the Firestarter trophy. Missable! Main Quest: "Mysterious Ways". In this mission you will hear from villagers that the Priest of Uzhitz has vital information for your quest. Go see him. He will invite you to the tavern at night. After talking to the priest, advance time by waiting (press Touchpad) or sleep in a bed till nightfall. Head to the tarvern by the Uzhitz church. Sit down with the Priest and always pick the first dialogue option at the top. At the end agree to drink with them (again the first dialogue option at the top). You will get a unique cutscene with the trophy pop afterwards. If you don't show up to the tavern you can apologize to the priest to get a 2nd chance. If you don't show up you can miss this. Likewise, if you pick the 2nd dialogue choices in the tavern you will miss this too. For this trophy you need to court/romance Theresa. This is fairly easy to do, but you need to advance far enough into the story to unlock the town of Rattay. You will get a side quest here during a main story mission to visit Theresa called "Courtship". For this all you need to do is pick any of the three locations at the first meeting (the river is an easy one to do) and then say whatever in the dialogue, it does not matter if you fail any. You will then need to wait 2-3 in game days before she will go out with you again. After 2-3 days you'll get a new marker and you'll go to the tavern. Fight the guy here and win. Wait 2-3 days again and this will be the final date where the trophy/achievement "McLovin" unlocks. For this trophy you need to court/romance Lady Stephanie. This is pretty easy to do and doesn't take long. After advancing just past the Rattay town main missions, go back to Talmberg and talk to Lady Stephanie. She'll give you a side quest called "At Your Service, My Lady". You need to get 3 items for a wedding. Once you've got all those items (doesn't matter how you get them, just get them), return to Lady Stephanie and she'll give you a shirt as a reward. It is important you try on the shirt there and then! You won't get the Casanova trophy else. Watch the cutscene after putting the shirt on and the trophy/achievement unlocks during it.